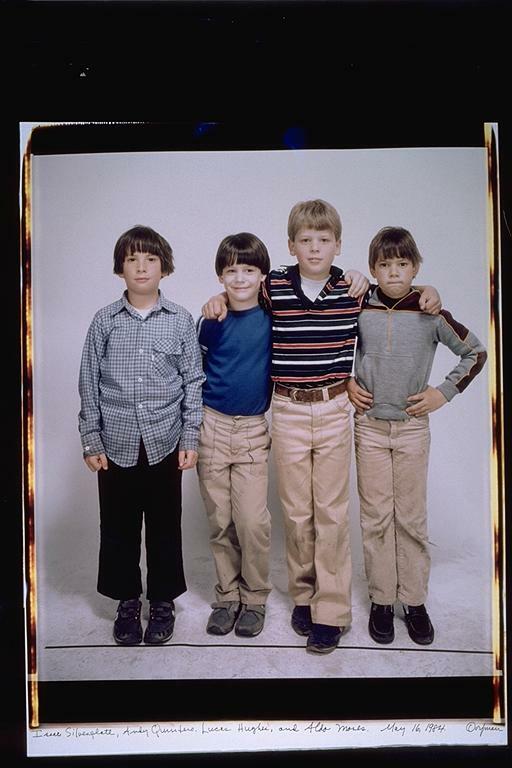 Elsa: When I started using the 20x24 in 1980, my first subjects were my family and friends. Naturally, I took pictures of my son, Isaac, and his pals, Eugene Schneeberg, Aldo Moses, Rafi Hopkins, and Zephyr Secher. Casey Gane-McCalla lived in the neighborhood and joined them in high school. These boys lived only blocks apart, and went to the Martin Luther King, Jr. Open School in Cambridge, Mass. and Cambridge Rindge and Latin. 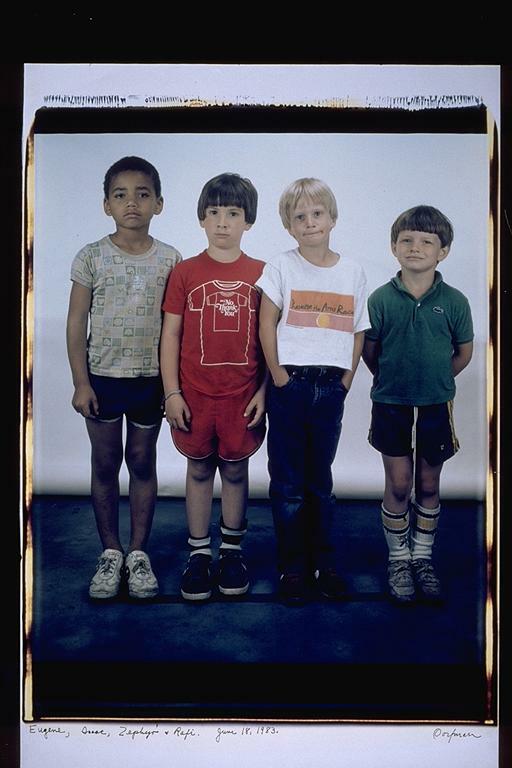 Until 1987, I had the Polaroid 20x24 camera one day a month and so I took pictures of Isaac and his friends sporadically. 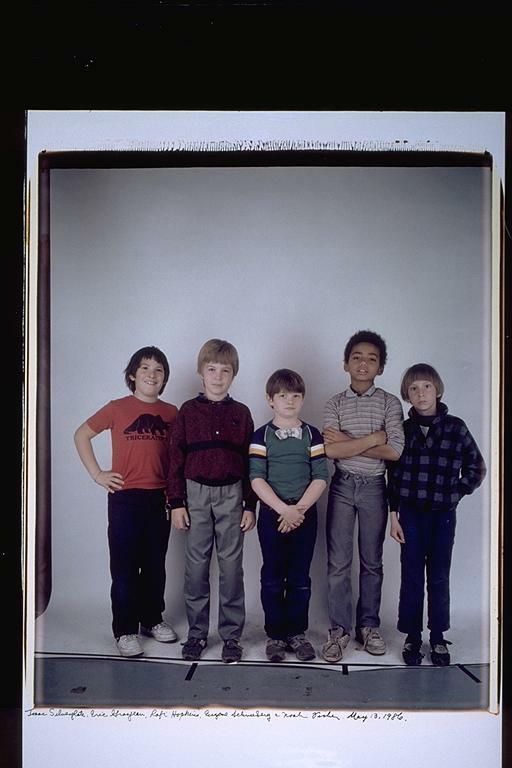 But beginning in 1987, when the camera came to my studio on Mass Ave in Cambridge, I was able to take pictures of the boys whenever they or I felt like it. All of the boys became familiar with the camera and my routines and they all -- off and on -- have helped me frame. I like to think each of them has developed a good eye. Now they are 24 and men. When the boys started, the Martin Luther King Jr. Open School was only a few years old. All the parents were involved. The teachers worked like dogs. It was interesting, what happened to the kids, in the early days of the King Open School. They came out very special. They were used to talking about all kinds of complicated things amongst themselves, and many of them had complicated lives. Somehow the teachers taught them how to talk amongst themselves and how to respect each other and how to accept other people's problems. I have no idea how it all happened, but I credit a lot of how well these kids turned out to the King Open School. Eugene: This must have been kindergarden. The first year that Isaac and I knew each other. I was five and Isaac was six. Come to think of it, maybe Elsa's pictures are one of the reasons that we have all stayed friends. It's a stretch, but over the years we always look back on the pictures and laugh, and almost cry. We were cute. 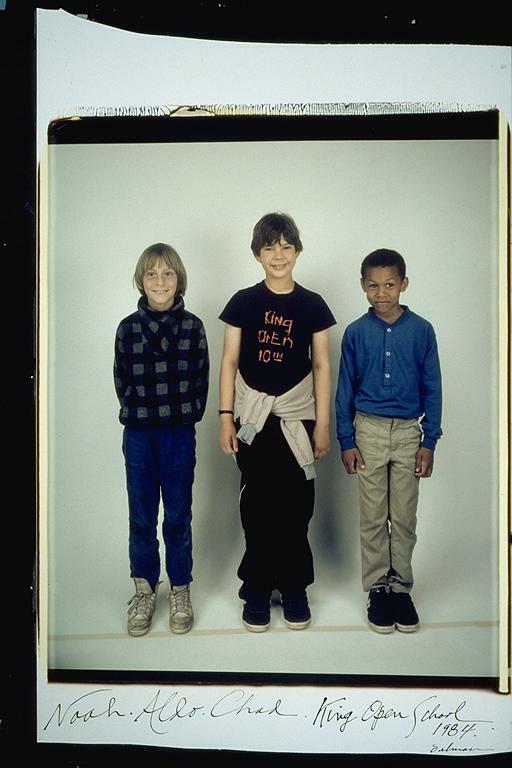 Isaac was my first best friend, Rafi was my best friend for a while in later years, and me and Zephyr were a fierce combination on the basketball court (he was always better then me:) Now we are all still good friends and I hope that we can all be together, maybe for my wedding. The last time I saw Rafi was a year or so ago on his birthday. He went his separate way from the group around 9th grade. That was unfortunate, I have many fond memories, with Rafi, Liza, Susan, Shaundi and Gram (in Marshfield)! Aldo: Wow, to see this picture is really funny. To know everyone now as adults and to be able to see them at five and six. 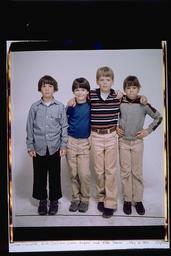 I think at this age, there were not any tightly bonded friendships, just kids, who were going to the same school. But almost twenty years later, to still be good friends, and to think of all that has happened in between. It's been a long road, and from this young age our friendships began to grow. Isaac: I believe this is kindergarten. If that's the case, this is where it all started. At one point or another, I've had close one-on-one friendships with each of these guys: Zephyr and I were in the same class together and bonded over our common crush on this girl (who shall remain nameless), Rafi and I spent countless hours editing movies together in grade-school, and Eugene and I were best friends for years. At this point, at the starting line, there were no real common experiences yet. When I look at those faces I see lots of potential. Anything could have happened. 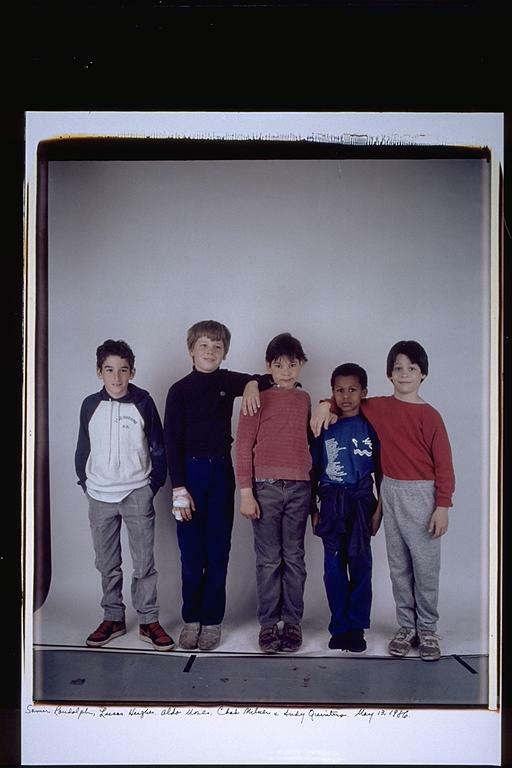 Aldo: I was seven years old when this picture was taken. This is the earliest time in my life I have memories. 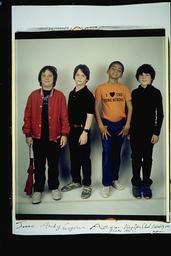 I'm on the far right, and the kid standing to my left is Lucas Hughes, he was my best friend. I even remember the shirt I was wearing because it was warm, and me and Lucas were always out riding bikes or trying to go wherever we could. Isaac: I wonder why everyone has arms around each other except for me. That's kind of sad. What a bunch of jerks. 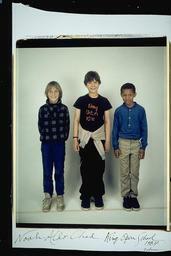 Aldo: This is a funny picture, cause I not only look quite silly, but notice I'm a bit taller than the other two guys. It's a reminder that up until 18, everyone was growing so much. One year you were the tallest, and the next, the same as everyone else. And I also can't help but recognize, how modestly we kids were dressed, in comparison to kids these days. Most clothes were hand me downs. Aldo: Again at this young age you'll notice how little importance was put into our fashion. This is a good thing, I think. At this age, most kids were getting dirty every few hours. This must be around the time when Eugene and Isaac became close friends. Friendships began early and lasted long when I was growing up. Aldo: Randy, that is exactly what I think of when I see us five together. We were all in a class that was taught by a guy named Randy. He was a great teacher, and I think every student felt like he was their friend. And he was really a big guy, so we all looked at him in awe. Here was this big, strong, cool guy, who was our teacher. Isaac: Before "Jurassic Park," I had a fine appreciation for prehistoric reptiles. Rafi was always my idol when it came to humor (note the bow-tie). I was never close to Noah and Eric; what can you do. Eugene sure was a skinny little thing. Aldo: This picture I actually remember the day, which is pretty strange for me. I have very few detailed, drawn out memories before 7 or 8. Just quick flashes of events. This is one of them, because of Rafi's "dollar tie." I remember watching Rafi put on the tie, it seemed so neat, and I remember wishing I had something neat to show people that I made. Aldo: When I look at this picture, I can only think how much they have grown. More in the physical sense, if anything. 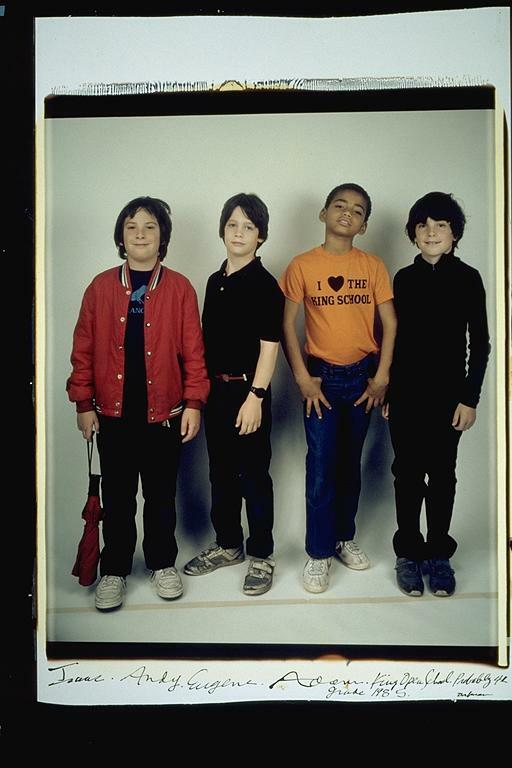 All these kids are now men. Eugene and Frank are both very tall and pretty strong. And Isaac, these days, in is great shape. He's very strong. Looks like he's very fit. It's amazing what physical changes do to you as a person as well. You're forced to think like an adult only cause you resemble one. So in 15 years, you go from kid to man, and there's no looking back. Aldo: "The basketball players" is what this picture can fairly be named. These four guys loved to play basketball, and many of them continued to play as they got older. All of them played high school ball; Zephyr and Frank were teammates and Eugene played for a different high school team. And both Zephyr and Frank played college ball, as Eugene began to focus more on academics. 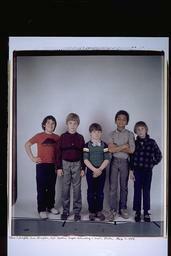 Aldo: For sure this must have been the "hey, we're boys, look at us" picture. It looks so funny to me now, but I'm sure when it was taken, I was trying very hard to look as cool as possible. This picture has many groups of friends who mingled with each other, but usually formed groups of two, or maybe three, to hang out with.